This year’s National Association for Broadcasters (NAB) in Las Vegas proved to be a good one for product announcements. 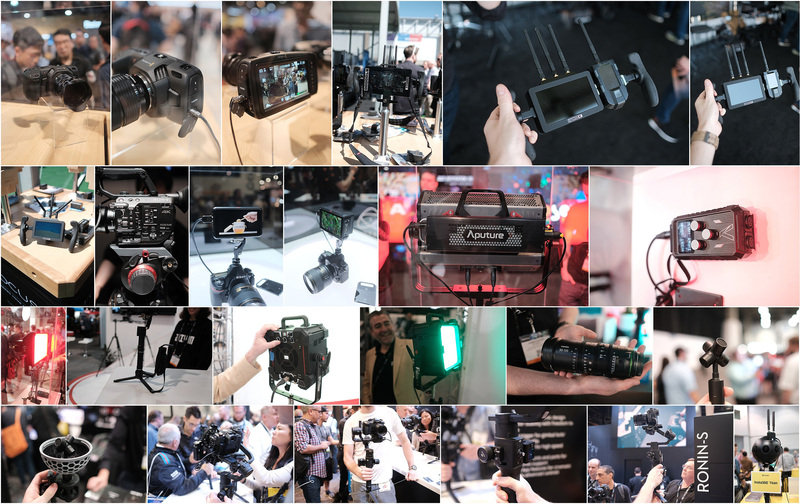 With over 100,000 people in attendance, NAB has become a bit of a holiday for the gear savvy videographers, who are excited to see what new products are to be announced. As usual, we were there in attendance and had our video techs out checking out all the new announcements, to find which ones will be eventually named their favorites. A quick note before we get started: a product’s presence on this list doesn’t necessarily mean that we’ll carry it, or even that it will ever exist in the same form that I’m describing here. These sorts of announcements are notoriously nebulous. This is just a list of stuff that piqued our collective interest. “Mark II” might be a little too strong of a name choice because this is a pretty limited update. There are no changes to the body aside from a black ND filter knob, as opposed to the silver knob on the Sony FS5 Mark I. I don’t have any complaints there, though, as the FS5 Mark I body is a near-perfect size and shape for the kind of work people are doing with it. 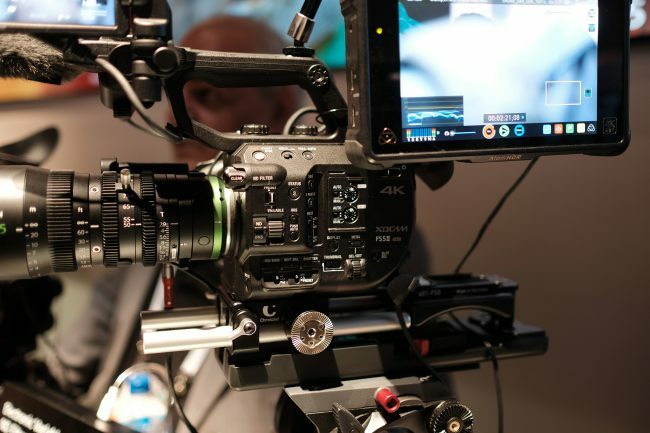 Feature-wise, the Sony FS5 Mark II adds internal 4K at 120fps in a 4-second burst and includes RAW output and continuous HD recording at 120fps, which were both paid license upgrades to the Sony FS5 Mark I. The sensor is the same, but Sony claims that added color profiles designed for the Venice will provide better skin tone reproduction. How effective these profiles are, remains to be seen. Blackmagic are no strangers to hype-building, and this latest camera announcement seems to be generating even more interest than their previous NAB reveals. Dual slots enable the camera to record RAW to CFast media or ProRes to UHS-II SD cards. Maximum frame rates vary from 60fps in 4K RAW to 120fps in windowed HD mode, both continuous. 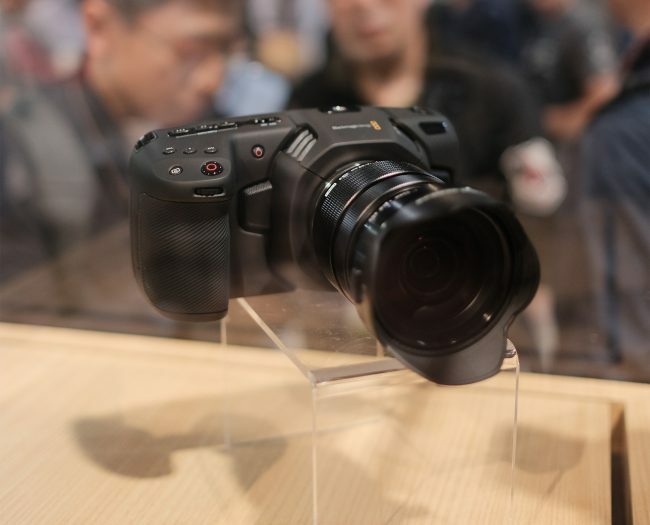 Similar to Panasonic’s EVA-1, the Pocket Cinema Camera 4K also includes dual native ISOs of 400 and 3200, which ought to make the camera much more effective in low light, something Blackmagic has always struggled with. 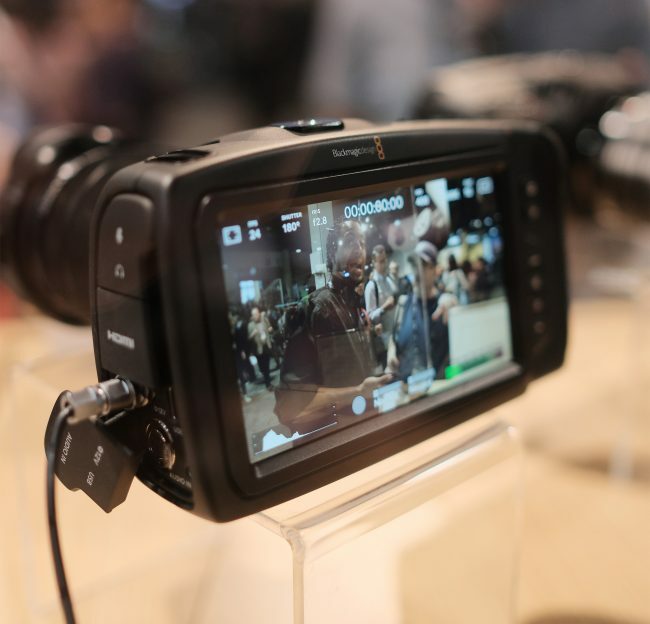 These features, plus a full-size-HDMI output, mini XLR input, active micro 4/3 mount, USB-C interface for external drive recording, and 5-inch touchscreen make the camera a very attractive option for the money. If it ships without bugs, I’m sure it’ll be a frequent player on low-budget shoots. What we’ve got here is basically a 5-inch version of the Ninja Inferno: 4K recording up to 60fps, ProRes and DNxHD support, HDMI looping, a 10-bit 1000 nit monitor, and all of the monitoring tools found on Atomos’ other recent recorders. The only major difference, aside from the slightly dimmer screen, is the battery and media support. To keep size and weight down, Atomos stuck to a single battery plate and developed a smaller SSD, the SSDmini. This new media still uses a SATA III connector, so it’s backward compatible with all SSD readers and, with an attached plastic extender, any of Atomos’ other SSD-based recorders. Another interesting feature is the expansion slot built into the back of the recorder. Atomos doesn’t seem to have any specific plans for this yet, but they’ve mentioned possible future support for additional power or signal input options through this port. The Vitec Group have become the Proctor and Gamble of the video world. OConnor, Manfrotto, Sachtler, Wooden Camera, SmallHD, Teradek, Paralinx, Litepanels, Anton Bauer, and many other brands are all owned by this mammoth parent company. 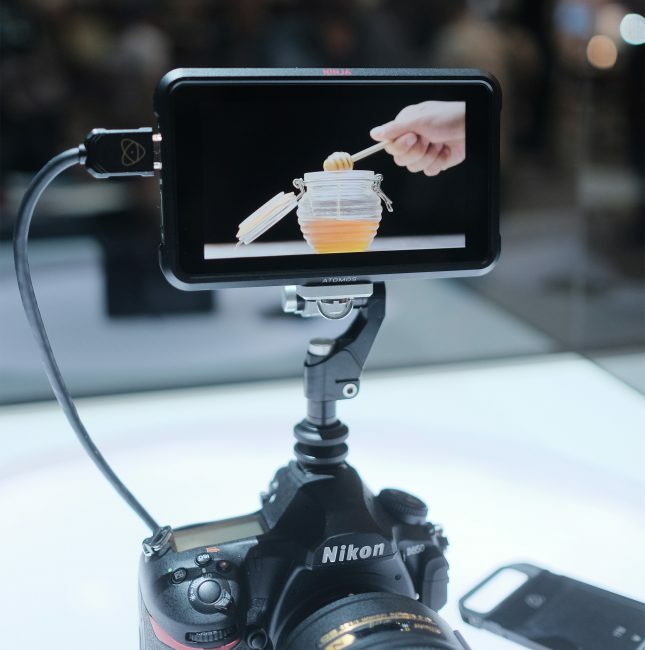 It may not be great for competition, but it has at least led to some interesting products, including the SmallHD Focus Bolt Transmitter and Receiver. Like the SmallHD 7-inch 703 Bolt before it, the Focus Bolt Receiver is just a SmallHD Focus with a Teradek Bolt 500 receiver built in. While it will work with a standalone Bolt 500 transmitter, it really shines in conjunction with the Focus Bolt Transmitter. 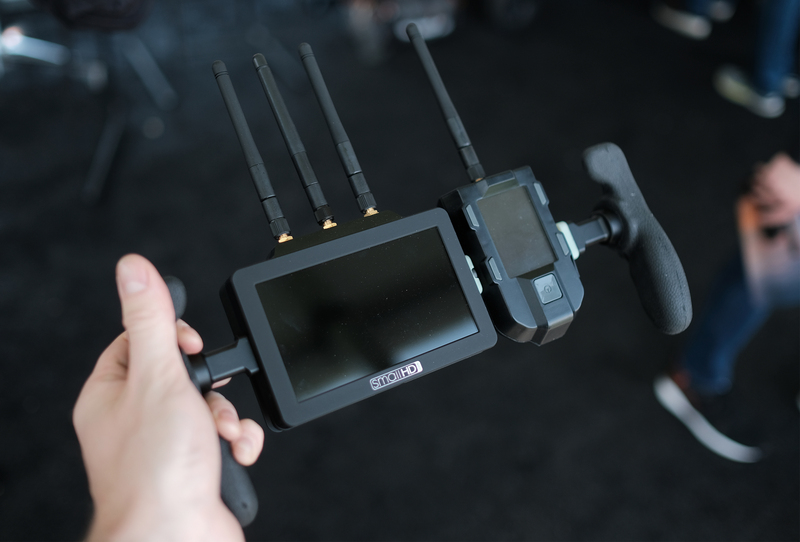 SmallHD wisely also created a Focus monitor with a built-in Bolt transmitter so that you can pair your on-camera monitor with your director’s monitor for a wireless video solution without any standalone products. The Focus Bolt transmitter will also work with the 703 Bolt. 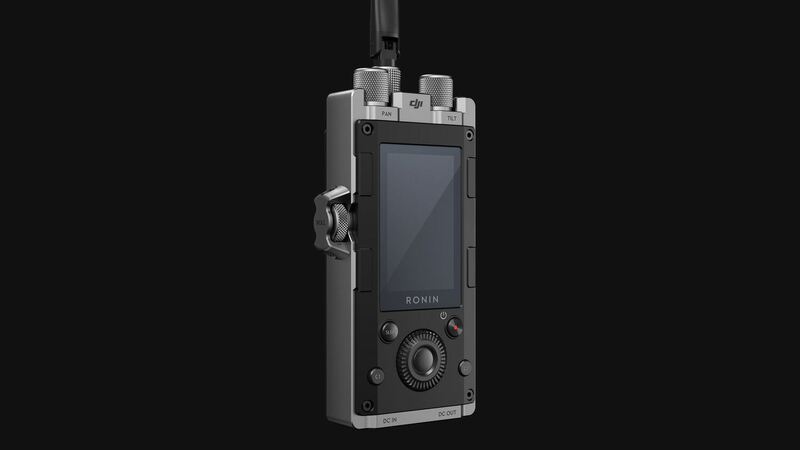 Rode partnered with Soundfield to make their answer to Sennheiser’s AMBEO mic. You’ll notice a similar tetrahedral condenser array and XLR breakout cable. Post-production will also be similar, with Ambisonic A format audio coming straight from the mic needing to be converted to Ambisonic B format for monitoring and export. Rode will be releasing their own free plugin to perform this conversion. While VR is the most obvious and likely use for this mic, I wouldn’t consider it an option for VR only. After all, Soundfield pioneered this technology and has been making ambisonic mics and recorders since the late 70s. Like their other equipment, the Rode NT-SF1 could also be used to simplify a 5.1 mix or allow for more directional flexibility in a live recording. We try hard to stay out of new product speculation on this blog because we don’t see it as a strength of ours. We’re not breaking news here, and there are plenty of other sites where you can read rumors and get excited about technology that could be years away or never released at all. 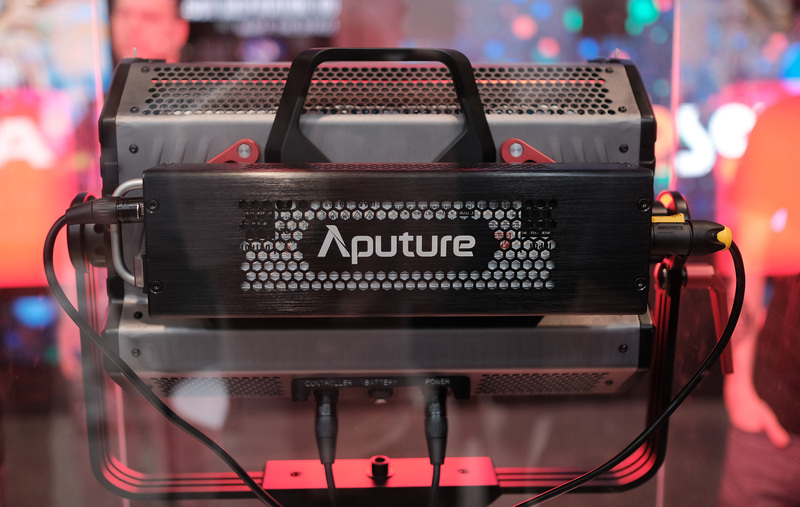 ALL THAT SAID, Aputure is releasing an RGB panel sometime in the future, and it looks pretty cool. There’s not a model number or release date yet, so I wouldn’t hold your breath waiting for it, but they did have a working model that featured some interesting ideas. I’m not going to go into a ton of detail here because all of this could change by release, but Aputure is working on a handheld color picker to work with the panel. Ideally, this would allow the operator to use ambient or directional color metering to more easily match existing sources. Again, this isn’t something I’d expect to see in real life anytime soon, but it’s a very creative idea, and it could be a killer feature if they pull it off. The VR world is becoming increasingly crowded and competitive. One of the few standouts in recent years that has been within the budget reach of many filmmakers has been the Insta360 Pro. It’s our most frequently-rented 360 camera, and it’s the one I’ll almost always recommend for its ease of use and great picture quality for the price. 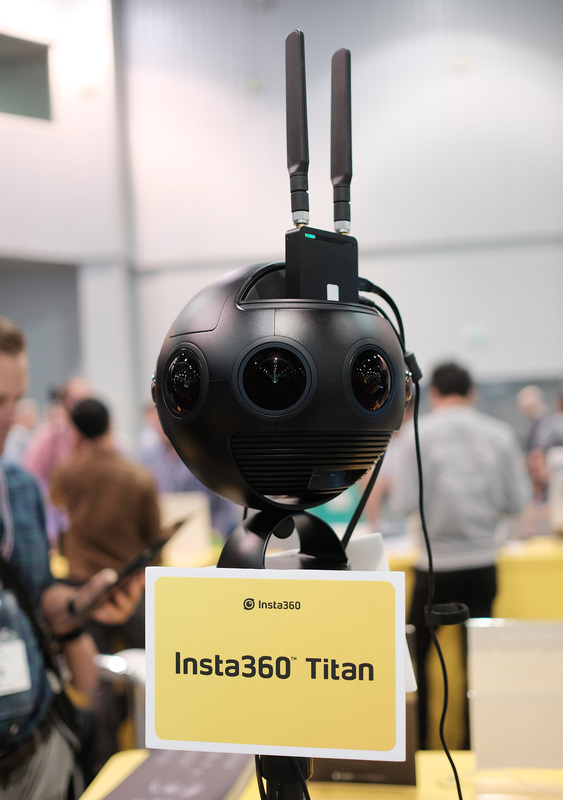 It’s exciting, then, to see Insta360 follow up the Pro with the Insta360 Titan, their newest 360 offering. The Titan features eight lenses (as opposed to 6 on the pro) each with their own micro 4/3 sensor that combine to allow for 10K resolution at up to 60 frames per second. Those specs might be overkill for traditional delivery, but for VR work, where the viewer is only seeing a small section of the total field of view at a time, high resolution and frame rate are extremely important for creating a lifelike image. 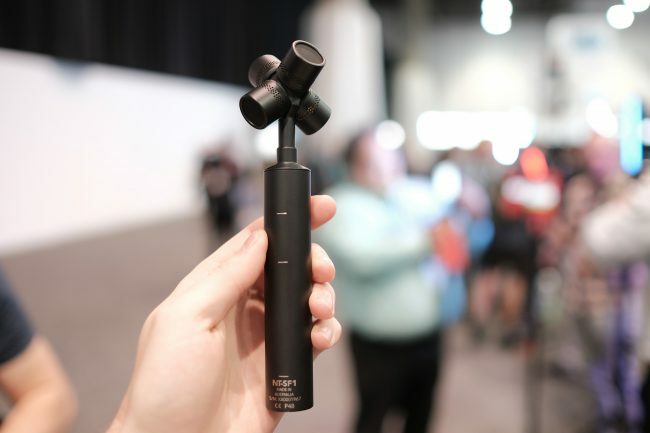 If the Titan is as simple and effective as the Insta360 Pro, expect it to be a very popular option for VR filmmakers when it’s released. It doesn’t have any tricks up its sleeve, and it wasn’t bringing in many wanderers to their booth, but Fiilex’s Q8 was the most impressive light I saw at NAB this year. 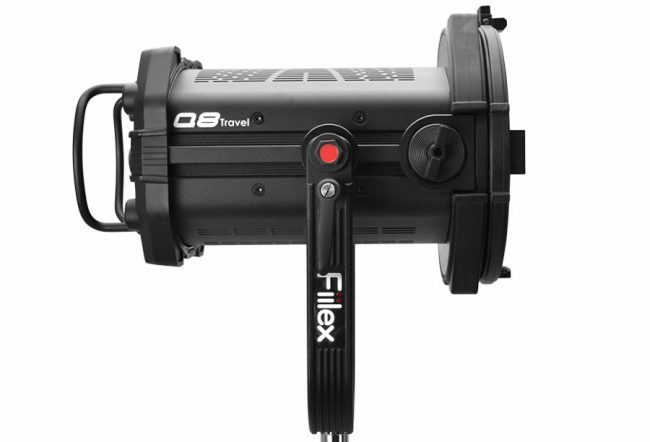 It’s lighter than their Fiilex Q1000, just as bright, and features an incredibly effective 8-inch fresnel element that gives it a focus/flood range of 12 to 60 degrees. That sort of range is unheard of without swapping fresnel elements, and early review videos show that the falloff is remarkably even. It may not seem impressive surrounded by all the flashing lights of a Las Vegas show floor, but this will likely be a very popular fixture for professional gaffers. DJI tends reverse-engineer existing products, allowing other companies to do their R&D so they can add a few clever touches and release a more affordable version without having to invest as much in engineering. This time, appropriately, they’ve done it to the Movi Mimic, Freefly’s solution for wireless gimbal control. There are enough additions to the DJI Force to keep it from being a total ripoff, though. Physical knobs for axis speed and locking power input are both welcome features. Especially clever is the 1/4 20 thread for mounting the unit to a tripod for smoother motion control. I realize it’s tough to get excited about a codec but, more than any gear announcement, ProRes RAW has the potential to greatly affect multiple areas of this industry. If Apple and Atomos have their way, this could become a new RAW standard, enabling easier and cheaper RAW workflows by keeping data rates down. Lower data rates could also eventually lead to RAW video support on more affordable cameras. If the codec is a success, here’s hoping it stays relatively open. Apple already only allows Windows machines to read ProRes files and not write them. If ProRes RAW is, say, only supported by Final Cut or only usable on Apple machines, that would be a missed opportunity to standardize this space. 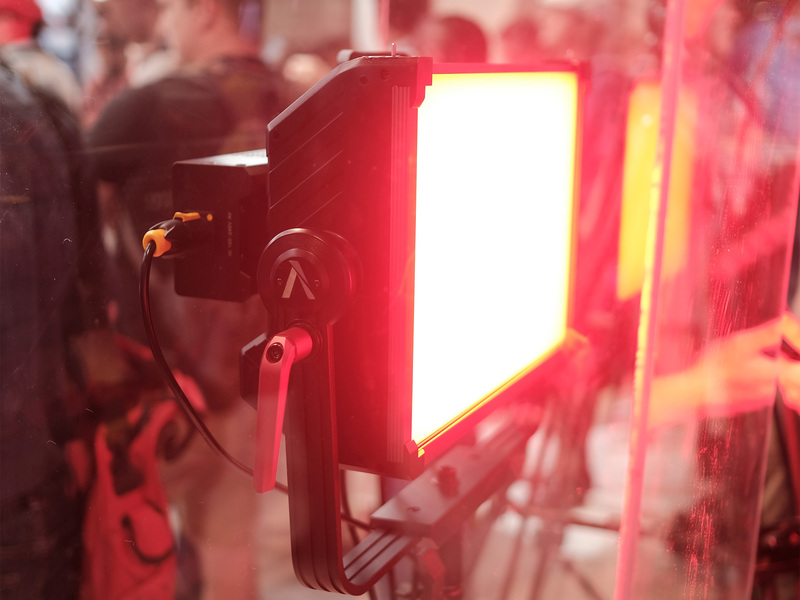 This list is only the tip of the iceberg regarding product announcements and interesting ideas that came out of NAB this year. I know I didn’t have space to cover everything here, so if there’s something that caught your eye, feel free to mention it in the comments.